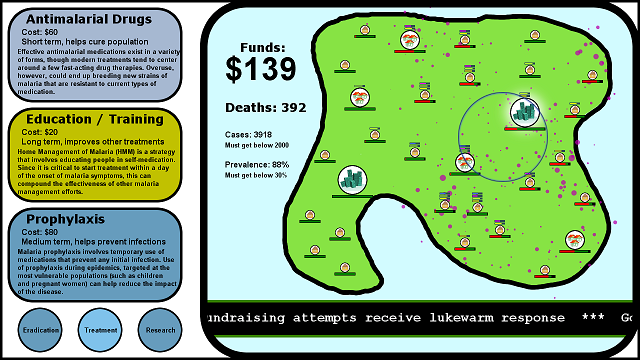 Plasmodium is an educational resource management game about malaria. I built it as part of a team for the 2011 U.S. Imagine Cup; my teammates were Cole Ott, Igor Terzic, and Kelsey Harris, all fellow Computer Science students at Dartmouth. Plasmodium followed in the footsteps of Alternex, my previous solo Imagine Cup entry. In this case, the player was faced with an outbreak of malaria and had to deploy a variety of upgradable tools (bed nets, insecticides, drugs) to eradicate it. The game was intended to take the appearance of a live television report on the crisis (complete with news ticker), though this art never really came to be. With all of us distracted by schoolwork, the game only barely reached alpha before we submitted it, and it did not make it into the third round of the competition.